You’re sitting on the button with a pair of aces in your hand, looking down at a nice, low flop with few possibilities that you’ll be beaten. You go all in. The dealer calls. He flips up his flopped pair of 9s. You scream “hold”! The turn falls blank. You scream “hold”! The river brings a… nine. He scoops the pot and you are left wondering what happened. This story is all too common. Poker can be quite a challenging game at the best of times and having your pocket aces cracked by a newbie call is really not out of the ordinary. But every now and again, a real downswing sets in — a crippling reminder of poker’s foundation in statistical variance. It can be weeks, months, or even thousands of games without a win. That’s when a downswing gets serious. My worst ever downswing lasted for three months when I was playing every day. Thousands of tournaments and SNGs yielded little results and my bankroll whittled away as quickly as my hopes of making my rent payments on time. It was a living nightmare and it felt like there was nothing I could do about it. Why do you need bankroll management skills? A downswing can be defined as any point in which a player is running bad; when the cards are falling so out of favor that it seems impossible to win money back from the cost of buy-ins. Players who are usually profitable find themselves unable to win a hand, let alone come first in a tournament. Downswings are the main reason why you need solid bankroll management skills. Bankroll management is a concept that has been put in place so that you will have enough money in your bankroll to cover the damages of inevitable downswings — and you had better believe they are inevitable! A downswing is horrible for any player. Seeing your cards continually busted by someone’s shocking calls and your bankroll trickle away; these are never nice. But what makes it worse is that a downswing can cause you to start playing worse. You may try to compensate for your bad-runs with overelaborate plays or bluffs or you may become a nit because you are knowingly or unknowingly scared of losing more. All in all, you may find that you become unable to pick apart what is bad luck and what is a bad play. You may start to question everything from your own ability to the legitimacy of the site. When downswings happen to you then, it’s important that you continue to play your A-game, no matter what. Not doing so can make the situation a whole lot worse. Correct bankroll management is a good start. With a decent strategy in place, you should be able to push through until you are running good again (if you are, indeed, actually a profitable player in the long run). A general bankroll management strategy means having at least 100x buy-ins for small SNGs and closer to 500x buy-ins for large SNGs and MTTs; though more is better. When running bad, it’s also wise to switch to a lower stake, especially if you have lost enough of your bankroll to justify it. This can relieve a lot of pressure, as you will at least start losing money at a rate that you can handle. This also prevents the downswing from decimating your bankroll. When you start winning again and you feel more confident, you can then move the stakes back up as your bankroll allows. How to prevent the downswing in poker? One way to prevent the downswing in poker (or any game) from getting worse is to join new sites. This may sound counterintuitive, but you can often take advantage of sign-up bonuses to get a small but free bankroll to play with. Players in New Jersey can enjoy online poker in the USA with the 888 New Jersey site and get $20 to play with for free. This can then be used to play low stakes cash games or SNGs and attempt to build an entirely new bankroll. 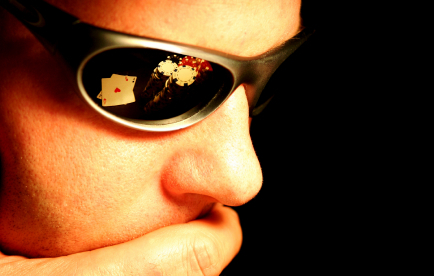 As well as proper bankroll management, you should also focus on emotional control while you are playing. A downswing can be incredibly demoralizing and leave you feeling saddened and frustrated at your poker game. This isn’t a good head-space to be in if you want to win. The optimal mindset is to keep rewarding yourself for making the right plays and stop beating yourself up over bad-beats that you have no control over. Keep your downswing in perspective and focus on the things that you do have control over — namely, making the best decisions possible in a given situation. To make sure you are making the right plays, you can use hand analysis software to play back your hand histories after each session. You will find that this gives you a more objective overview of how you are playing as you can think about situations without the psychological pressures of money creeping into your thought processes. You should also keep trying to love and enjoy poker. Consider taking some time off can help you to clear your head so that when you come back to the tables, you’ll have a fresh perspective and a new invigoration. Reading, watching shows and tutorials, and generally carrying on learning about the game all help you to stay focused on what matters — playing the best game that you can, no matter which way the cards fall.